Very pretty! Ordered two and put them on antique dressers for our master bathroom. Add a touch of color to your bathroom with a Kraus glass vessel sink and faucet combination. Handcrafted from tempered glass, the modern bathroom sink coordinates with a variety of decor styles. A freestanding basin design creates a dramatic look with contemporary appeal. Vessel installation offers an easy top mount option for all your stylish bathroom ideas. The textured surface of the sink is dynamic and requires minimal maintenance to keep clean. Pair it with a waterfall faucet with matching glass disk for additional value, and create an instant style upgrade for less. Dimensions 10.0 In. X 20.0 In. X 30.0 In. The Irruption Red Vessel Sink and Faucet are more beautiful in person than on the computer screen. By far and away the prettiest sink my wife and I have ever seen. We're very pleased we found Overstock.com in time for our home remodel, and anticipate finding more values. We absolutely recommend their Irruption Red Vessel Sink if you're looking for something romantic and beautiful, yet strong enough for daily use. Ours is located in our master bath, and a pleasure to see every morning. I put the sink in our guest powder room and it makes a statement!!! It is gorgeous and always the topic on conversation when we have people over. Please note the actual glass itself is not red but the underside is treated. This give the glass a 3D effect and highlights the finish. I love this sink. If you have a countertop with an exisiting opening for the sink then this will not work unless you want to sit the bowl down into the opening. The actual hole in the countertop is only a few inches. The price can't be matched anywhere even if you can find something this unique. We received our sink in about 2 business days! It was ready long before the contractors were ready to put it in, so I had to hold myself back from writing a review until we had a chance to use it. It's been in for a week and we really love it. It is absolutely gorgeous - the colors are so clear and wonderful. We are adjusting to the lever but have no doubt we will soon know exactly where to place it to get the desired water temperature. We're not having any problems with overflow or water splashing out of the sink. It was great that the sink had its own drain and faucet and we chose the gold color. It matches our polished brass fittings to a T. We could not be happier about this sink - and the cost for the sink and all the hardware was less than for some brass faucets alone that we saw! I could not believe the weight and quality of the faucet and other fittings. I was afraid the lever would be small and painful to push since I have arthritic hands, but that is far from the case. Would recommend this sink to anyone - except probably not in a bathroom used by children since it is glass. I installed the "Knock Out" vessel sink and waterfall faucet on a beautiful granite vanity top surrounded by wall and floor tile that compliments the sink and faucet. 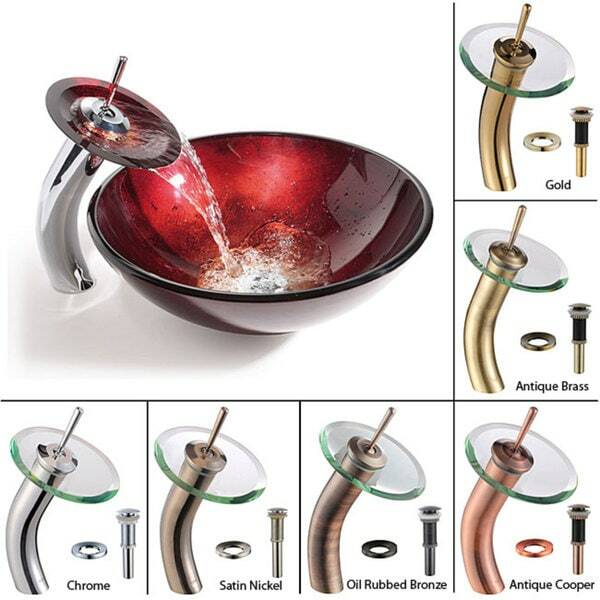 In addition to the stunning appearance of the sink and faucet, they are very unique, eye catching and functional. I have received dozen of compliments on the sink and faucet and several friends have taken pictures to show to others. It would be rare to find a comparable sink and faucet equal to the outstanding appearance and function, without paying hundreds more. My extensive search for a superior product was completely fulfilled with my purchase of Overstock's Kraus combination vessel sink and waterfall faucet. Like the lady in the commercial that showed a faucet to her architect and told him to design a house around the faucet, I really did design my first floor guest bathroom around this sink. I am an interior designer and they told us in class that you need to find a point of inspiration in a room and start your design with whatever it is: painting, chair, fireplace and in this fashion this sink became the focal point. I changed out an ugly white pedestal sink with this beautiful vessel sink on top of a custom cherry cabinet with a gorgeous piece of granite. Matching mirror and Kohler color one piece toilet and I went from plain to high end classy! We just love the way the water pours out of the faucet. And the sink is deep enough that there is no splash over. Remarkably, it also doesn't show water marks either. I know vessel sinks are not practical for everyday sink use, but as a guest bathroom, they rock! I recommend highly!!! We just installed our beautiful Red Irruption Sink on a floating vanity stained w/ an expresso finish, it looks fabulas! We had no trouble installing it and the pop-up drain that comes w/ is heavy duty,very impresive,not like the ones in your local hardware stores.We also bought the Amber vessel sink for our hall bath, were so pleased on all our purchases thanks for Overstock.com,otherwise we would Not have been able to afford 1 let alone 2. Were very HAPPY & SATISFIED,and you'll be too! Designer Quality!!! Faucet is beautiful. rice value is great. Big wow factor for this sink - it looks great, the deep reds, golds & the modern pattern! The faucet was bigger than we thought so will have to mount it to the side of the sink rather than at the back. Also, there is something rattling inside it but when the plumber comes to plumb it in, we'll get him to check it out using the directions supplied with it. We have to congratulate Overstock for great email answers to our questions prior to ordering, the service & the quick delivery - only 10 days to Western Australia & nothing cracked or broken!! And there isn't a sink like this here - believe me, I have looked. I have just purchased another Overstock sink for the other bathroom. We were SO impressed. Thanks Overstock! great sink looks great and the faucet is a very functional design. I could not ask for a more beautiful sink. The pics do not do it justice. Love our new vessel sink! It looks beautiful in our smaller bathroom...the cost was half of what we would have paid from the bathroom dealer! This piece was the show stopper of the bathroom! Very pretty color,very large vessel sink. We LOVE these sinks. We bought two for our remodeled Master Bath. Being a vessel sink I was afraid we would have a lot of water splatter around the sinks but we don't. The depth and shape are perfect. The color adds a real pop to the bathroom. Most beautiful sink....wonderful red color. So contemporary. A true statement piece! Arrived well packed. Easy to install. Look of the product. Value for price and free shipping. "Is Kraus Irruption Red Glass Vessel Sink the same color on the outside as it on the inside? What shades of red can I expect it to have? Is the bottom of the inside red? Thanks." Hello Bev, yes this is all a red wine color. There are some different variations of the color through out the sink. Have a great day! "Is Kraus Irruption Red Glass Vessel Sink translucent or opaque? Also, image appears that sink might have a metallic sheen under the red.....is this accurate?" Depends on the one you are getting.Yes the images are accurate.